Hey Readers, after so many Free Recharge & Offers here we are back with another article on How to Create a Free Blog & Earn Money Online. There are many People who want to create their Blog online but as they don’t know where to start from and How to create a Free Blog they drop their idea of Creating a Blog. Whenever we think of creating a blog, we drop the idea after knowing the expenses of domain, hosting, website developer, etc. Many newbies who want to start blogging don’t want to make an initial investment of funds to create a blog as they don’t have much experience. But there are also many ways through which newbie bloggers can Create a Free Blog. There are many blogging platforms which offer users the to Create Free Blogs without Investment. If you are looking for a simple free blog, my suggestion would be to start blogging with BlogSpot.com. Creating a Free Blog on Blogspot doesn’t require much knowledge about coding. You can get started with Blogspot without much knowledge of coding. The awesome part is that you can also Earn Money from your Blog. You can Earn Money Online Without Investing a single penny. So, if you don’t know about blogging and you are a newbie then this article for you. In this Article, you will be learning How you can Create your Free Blog & Earn Money From it. 1.0.1 Also Read : What Is BitCoin Mining? How Can You Earn BitCoin? 2 How To Create A Free Blog On BlogSpot? 3 How To Earn Money From Your Blog? BlogSpot is a blogging platform powered by Google. It offers you an opportunity to start a blog, but all your images will be hosted by Picasa (also part of Google). It was developed by Pyra Labs, which was bought by Google in 2003. Generally, the blogs are hosted by Google at a subdomain of blogspot.com. How To Create A Free Blog On BlogSpot? To Create your Free Blog, Visit BlogSpot Site & Login Using Gmail Account [If you don’t have Gmail Account you can Create one for Free]. Once you are Login, Click on Create a Free Blog. Now you are Ready to Create your First Blog. The first thing you need to do is Enter a Blog Name and select your Domain Name. I suggest you to use a name that you can brand later with a custom domain. After choosing the name & address of your blog you have to choose a template for your blog. Select any template you like, you can also change your template anytime you want. Go to “Settings” and make changes to improve your blog’s visibility. Once you are done you can click on “Posts” > “New post” and start writing your very first blog post. But before you write your first post I would recommend you to go to “Pages” and create new page. Pages are very important in blogging as it helps user to easily navigate through your Blog. You can create number of pages as per your choice. After adding pages, you can add Widget & Logo to the header of your BlogSpot blog, and add or remove various other features. 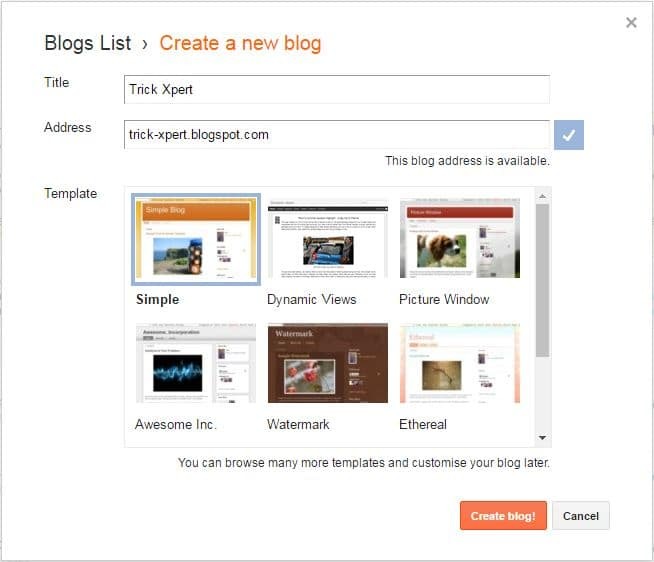 You can add as many Widgets to your Blog. To Add Widgets & Favicon go to Layout and customize your Blog. By Adding Widget, you can customize your blog as per your need. Once you have added Widget and Favicon, it’s time to Add/Customize your template. There are lots of Free templates available on the internet which you can download and apply to your Blog. 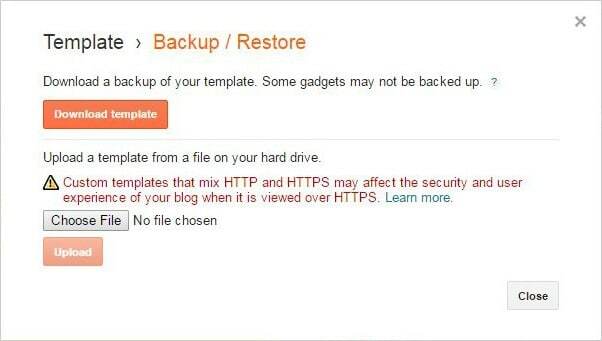 Go to Template & from top right corner click on “Backup / Restore”. If you have basic knowledge of HTML then you can edit the coding and make your site look more attractive. You can also customize your theme by clicking on Customise in Template. You can edit your template more efficiently by changing height, width, colour, etc. After doing all the above steps now you are ready to write your first post on your Blog. Click on “Post” > “New Post”. Now Start writing your first Blog Post. Once you click on New Post, Start writing your First Blog Post. Give attractive title and Start Writing your Post. Once you have some quality posts and content on your blog you can apply for Adsense and Start Making Money from your Blog. There are lots of ways through which you can Make Money from your Blog. But the best way is to Make Money From Google Adsense. Google Adsense is the best way to Earn Money Online. If you have good traffic to your site then you can also Earn thousands of dollar per month by Google Adsense. Click on Earnings & from there you can Apply for Adsense Account. Apart from Google Adsense, you can also Earn Money from another advertising platform. You can also use another advertising platform to Earn Money from your Blog. 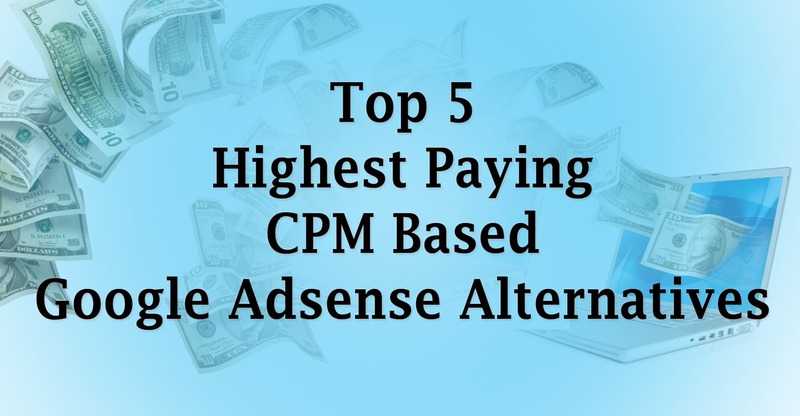 Here is Top 5 Highest Paying CPM Based Google Adsense Alternatives. Hope you enjoyed this Step by Step guide on How to Create a Free Blog & Earn Money Online. So, Start your Free Blog & Make Money from your Blog. Do Share this post with your Friends & Family. Comment below if you have any query. Stay tuned with us for more latest Tricks & Updates.